Positive. 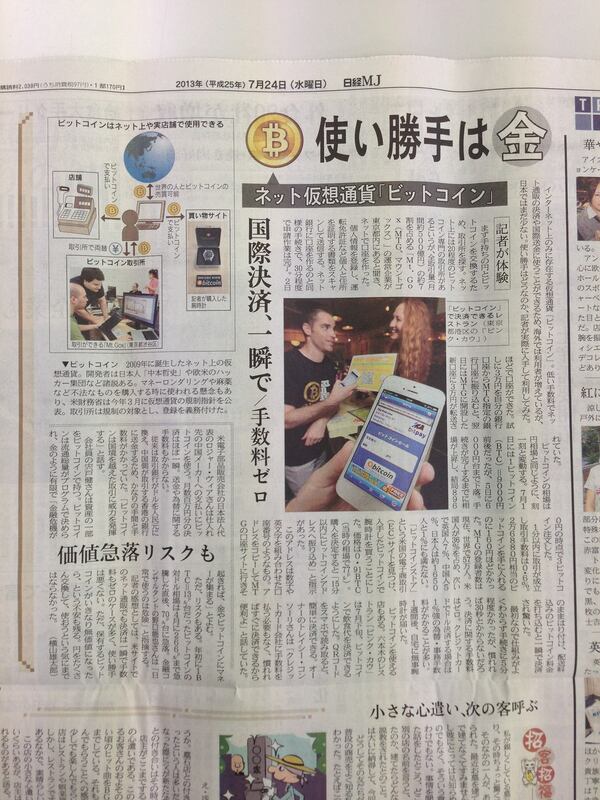 Discussion of how to use and buy bitcoins, as well as talking about a new restaurant that has started to accept bitcoin in Japan. “Bitcoin” is an internet exclusive virtual currency that allows for purchases and international money transfer over the Internet with minimal transaction costs. Although there have been an increasing number of users globally, there are still not as many users in Japan. To test their level of convenience, I purchased some currency and attempted to use them. Great coverage. It looks like things finally are turning around in Japan. That will be amazing for Bitcoin as the Japanese are tech-savvy, rich, like to save and also like to adopt new technology quickly. Does this actually mean anything for Japanese adoption, though? It was my understanding that the people are so loyal to their government that they wouldn't even consider something like bitcoin if it had the potential to damage their economy. That's somewhat of a blanket statement, but the landscape for bitcoin adoption there doesn't seem as ripe as other parts of the world. Perhaps the looming threat of hyperinflation of the Yen is enough to turn the tides? How worried is the Japanese public about their growing debt to GDP ratio? I mean, at 250% or whatever it is now, I like to think the people in this country would be running for the hills, but for them, it seems to be all or nothing. If people start ditching the yen and the yen goes into hyperinflation then all the government would have to do is to collect taxes with Bitcoin and pay their debt with those. But yes, hyperinflation of the yen would be pretty much be default for the government. But it would also mean the businesses which also have lots of debt would get their debts cancelled by getting new income in Bitcoin. The losers would be the biggest savers, which are the elderly who have spent their entire life saving for their pension.